The project is introduced with an aim to develop a crab farming system on 5,000 m2 with stocking density of 30-50 pcs/m2 within four months. Survival rate of crabs will reach 60% and production is estimated to reach 2.1 tons. The system is suitable with climate and soil of Hà Tĩnh. One hundred farmers are supposed to participate into training courses to learn farming techniques of commercial crabs. Hà Tĩnh Agriculture and Rural Development Department has set up a council to discuss for the approval of the project which is considered practical and necessary. It will bring high efficiency and be applied in other areas in the future. The project, therefore, is marked 80.1. 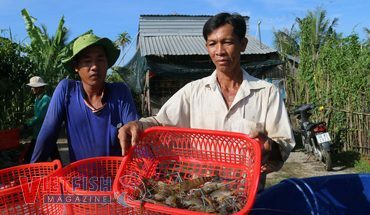 How to farm shrimp better in Vietnam?